To make the Cuban picadillo: Heat olive oil in in a large skillet over medium-high heat. Add the onion, pimento chiles and green pepper and sauté for about 5 minutes, until the onion has softened. Add the garlic and ground beef to the pan, stirring to break up the meat and combine it with the onion and peppers, and cook until the meat has browned, about 5 to 7 minutes. Add the tomatoes, cumin and oregano to the pan, stir to combine and reduce heat to low. Cover and simmer for 12 to 15 minutes to thicken. Stir in the olives and simmer 5 minutes longer. Season with salt and pepper to taste. 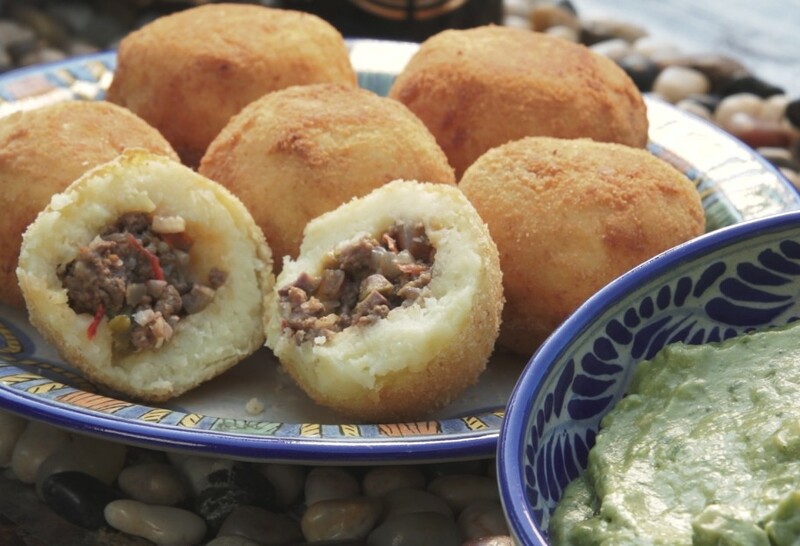 To make the papas rellenas: Place the quartered potatoes in a large saucepan and add enough water to cover the potatoes. Bring to a boil and cook until the potatoes are soft, then drain. Mash the potatoes with the salt and warm milk, and let cool enough to handle. Grab a handful of the mashed potato mixture and form into a little “bowl” in your hand. Fill the “bowl” with some of the Cuban picadillo and cover with more of the mashed potato mixture - forming a ball about the size of a small baseball. Repeat until all the mashed potato mixture is used up. Combine the bread crumbs and flour on a plate. In a small bowl, beat the egg with 1 tablespoon of water. Dip a ball into the beaten egg and roll to coat, then roll in the flour and bread crumb mixture until lightly covered. Dip the same ball, again, into the egg and roll a second time in the flour and bread crumb mixture to coat thoroughly. Repeat with each ball. Refrigerate the balls for about 3 hours. Add enough vegetable oil to a heavy skillet to come about halfway up the potato balls and heat over medium-high heat until hot, but not smoking, about 2 to 3 minutes. Carefully place as many balls into the oil as possible without crowding the pan, working in batches if need be. Fry the balls for about 2 minutes or until the submerged half is golden brown, turn the balls and cook another 2 minutes until golden brown. Remove the balls from the pan and set them on a paper-towel-covered plate or wire rack. Serve hot with avocado sauce on the side. To make the avocado sauce: Place the avocado, lime juice, cilantro, jalapeño chiles, garlic cloves, olive oil and cumin and puree until smooth. Season with salt, to taste. I watched your show tonight.. I am so excited to try your recipes!!! I have to learn to cook delicious Mexican food. I was brought up on American food, and Spanish food.